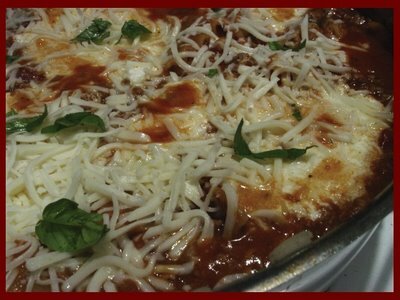 I had seen a recipe for Skillet Lasagna in one of the food magazines (Everyday Food?) but I couldn’t find it either in hard copy or online. I did find this recipe, and using ingredients I had lying around, adapted it. It’s actually pretty good. The consistency of the noodles are a bit different than a baked lasagna –- chewier, but it’s not an al dente issue — and it’s definitely saucier (eat it with some crusty Italian bread). But it didn’t take too long to make – maybe 30 minutes – and it was very satisfying. Heat oil in a large skillet over medium-high heat. Add turkey and onion and cook for about 3 minutes, stirring occasionally, then add garlic. Continue occasional stirring until turkey is no longer pink. Place dollops of ricotta on top of the pasta-meat mixture and bring heat to medium to heat ricotta through. Once warm, sprinkle with mozzarella and allow to melt. Garnish with fresh basil and parmesan, if desired. I was taking a look to your blog.I love people who likes prepare dishes.If you want to try one italian recepit, I can send you what you need.